DIE Lunæ, 23 die Septembris. Lady Drake's Petition for a Maintenance. Message to the H. C. for Committees to prepare an Answer to the Paper of The States Ambassadors. and with Lady Drake's Petition. Message from the H. C. with Letters from Sir T. Middleton & al. about the Surrender of Montgomery Castle, &c.
Ld. Herbert of Cherbury's Sequestration taken off. 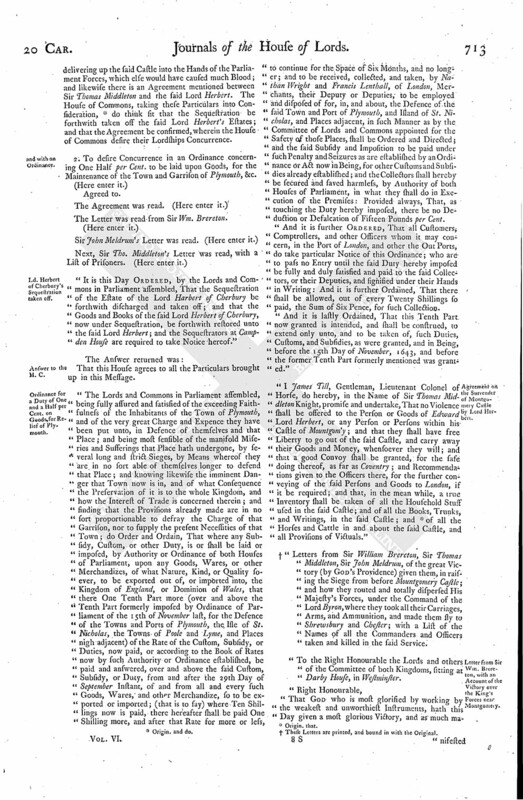 Ordinance for a Duty of One and a Half per Cent, on Goods, for Relief of Plymouth. Agreement on the Surrender of Montgomery Castle by Lord Herbert. Letter from Sir Wm. Brereton, with an Account of the Victory over the King's Forces near Montgomery. Letter from Sir Thomas Middleton, on the same Subject. And one from Sir John Meldrum. 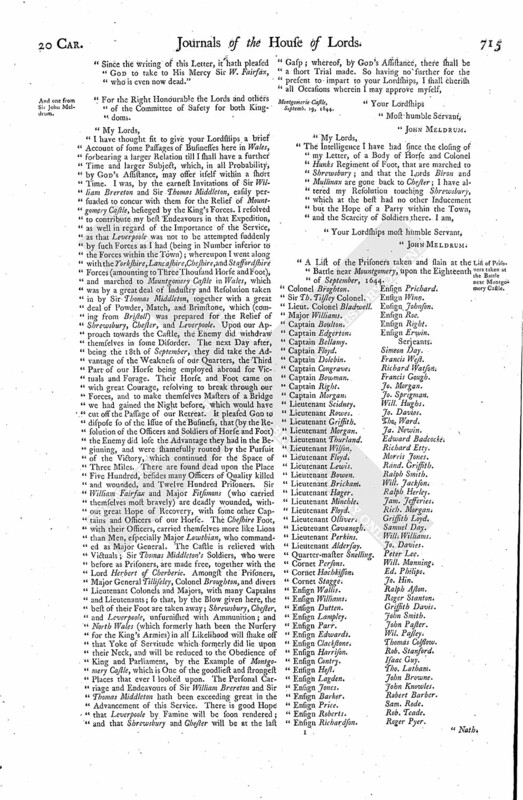 List of Prisoners taken at the Battle near Montgomery Castle. Upon reading the Petition of Dame Hellen Drake, the Relict of Sir John Drake, late of Ash, in the County of Devon, Knight; shewing "her great Losses she hath sustained by (fn. 1) adhering to the Parliament; desiring that the Houses would please to take (fn. 2) her Necessity into their Consideration, and allow her some Maintenance for herself and Family." Hereupon this House Ordered, That this Petition be recommended to the House of Commons; and that she may have assigned to her the House of Sir Thomas Reynolds to live in, ready furnished. To let them know, that the Lords, having received Advertisement that The States Ambassadors have this Morning in Person to their Lord Speaker renewed their Desire of an Answer, concerning their Endeavours of a Mediation for Peace, do think fit that the Committee of both Houses formerly appointed to treat with The States Ambassadors concerning the Ships, as also to whom this Business concerning Peace was formerly referred, shall prepare a fitting Answer to be made to them, concerning their said Desire, and to present the same to both Houses; and the Lords do desire the House of Commons to join with them herein. 2. To deliver to them the Petition of Dame Hellen Drake; and to let them know, that this House recommends the Particulars in the same to their Consideration; and that this House desires their Concurrence, that she may have assigned to her the House of Sir Thomas Reynolds, ready furnished, to live in. Next, the Ordinance for Ordination of Ministers was read the Second Time, and Ordered to be committed to a Committee of the whole House. To communicate to their Lordships divers Letters from Sir Thomas Middleton, Sir Wm. Brereton, and Sir John Meldrum; wherein is expressed the good Success God hath given the Forces under them, against the Enemy, before Mountgomcry Castle; also there is signified the good Service the Lord Herbert of Cherbury hath done, in delivering up the said Castle into the Hands of the Parliament Forces, which else would have caused much Blood; and likewise there is an Agreement mentioned between Sir Thomas Middleton and the said Lord Herbert. The House of Commons, taking these Particulars into Consideration, (fn. 3) do think fit that the Sequestration be forthwith taken off the said Lord Herbert's Estates; and that the Agreement be confirmed, wherein the House of Commons desire their Lordships Concurrence. 2. To desire Concurrence in an Ordinance concerning One Half per Cent. to be laid upon Goods, for the Maintenance of the Town and Garrison of Plymouth, &c.
The Letter was read from Sir Wm. Brereton. "It is this Day Ordered, by the Lords and Commons in Parliament assembled, That the Sequestration of the Estate of the Lord Harbert of Cherbury be forthwith discharged and taken off; and that the Goods and Books of the said Lord Herbert of Cherbury, now under Sequestration, be forthwith restored unto the said Lord Herbert; and the Sequestrators at Campden House are required to take Notice hereof." That this House agrees to all the Particulars brought up in this Message. 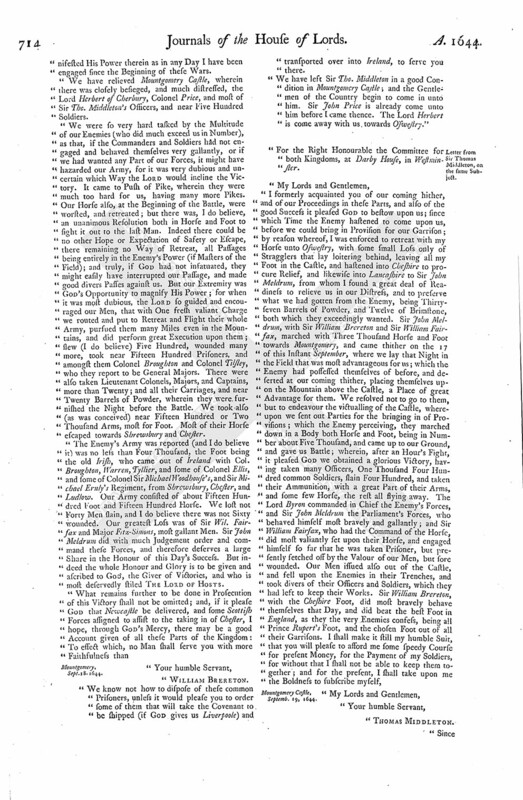 "The Lords and Commons in Parliament assembled, being fully assured and satisfied of the exceeding Faithfulness of the Inhabitants of the Town of Plymouth, and of the very great Charge and Expence they have been put unto, in Defence of themselves and that Place; and being most sensible of the manifold Miseries and Sufferings that Place hath undergone, by several long and strict Sieges, by Means whereof they are in no sort able of themselves longer to defend that Place; and knowing likewise the imminent Danger that Town now is in, and of what Consequence the Preservation of it is to the whole Kingdom, and how the Interest of Trade is concerned therein; and finding that the Provisions already made are in no sort proportionable to defray the Charge of that Garrison, nor to supply the present Necessities of that Town; do Order and Ordain, That where any Subsidy, Custom, or other Duty, is or shall be laid or imposed, by Authority or Ordinance of both Houses of Parliament, upon any Goods, Wares, or other Merchandizes, of what Nature, Kind, or Quality soever, to be exported out of, or imported into, the Kingdom of England, or Dominion of Wales, that there One Tenth Part more (over and above the Tenth Part formerly imposed by Ordinance of Parliament of the 15th of November last, for the Defence of the Towns and Ports of Plymouth, the Isle of St. Nicholas, the Towns of Poole and Lyme, and Places nigh adjacent) of the Rate of the Custom, Subsidy, or Duties, now paid, or according to the Book of Rates now by such Authority or Ordinance established, be paid and answered, over and above the said Custom, Subsidy, or Duty, from and after the 29th Day of September Instant, of and from all and every such Goods, Wares, and other Merchandize, so to be exported or imported; (that is to say) where Ten Shillings now is paid, there hereafter shall be paid One Shilling more, and after that Rate for more or less, to continue for the Space of Six Months, and no longer; and to be received, collected, and taken, by Nathan Wright and Francis Lenthall, of London, Merchants, their Deputy or Deputies, to be employed and disposed of for, in, and about, the Defence of the said Town and Port of Plymouth, and Island of St. Nicholas, and Places adjacent, in such Manner as by the Committee of Lords and Commons appointed for the Safety of those Places, shall be Ordered and Directed; and the said Subsidy and Imposition to be paid under such Penalty and Seizures as are established by an Ordinance or Act now in Being, for other Customs and Subsidies already established; and the Collectors shall hereby be secured and saved harmless, by Authority of both Houses of Parliament, in what they shall do in Execution of the Premises: Provided always, That, as touching the Duty hereby imposed, there be no Deduction or Defalcation of Fifteen Pounds per Cent. 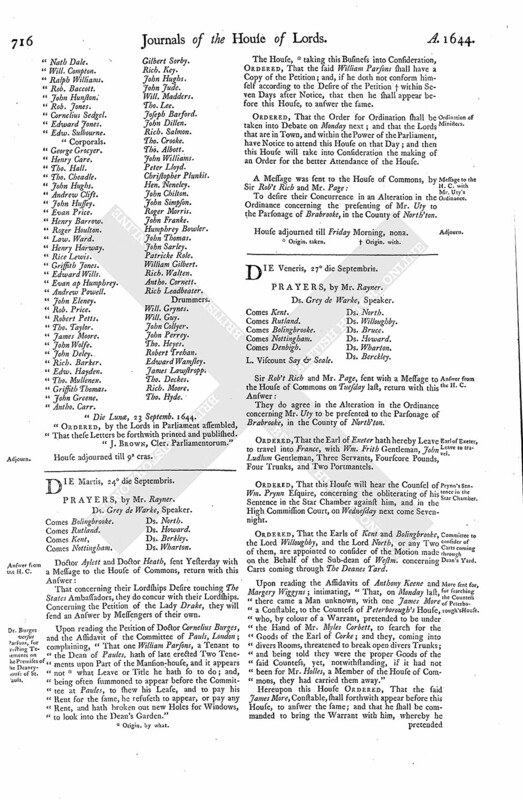 "And it is further Ordered, That all Customers, Comptrollers, and other Officers whom it may concern, in the Port of London, and other the Out Ports, do take particular Notice of this Ordinance; who are to pass no Entry until the said Duty hereby imposed be fully and duly satisfied and paid to the said Collectors, or their Deputies, and signified under their Hands in Writing: And it is further Ordained, That there shall be allowed, out of every Twenty Shillings so paid, the Sum of Six Pence, for such Collection. 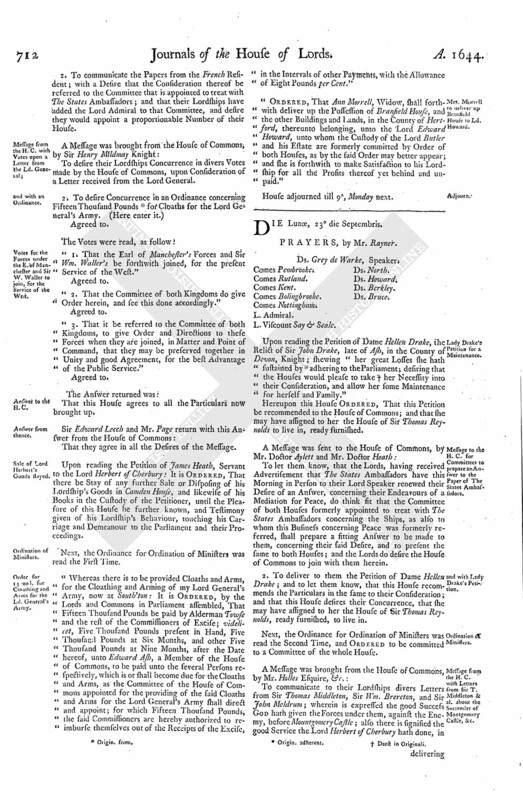 "And it is lastly Ordained, That this Tenth Part now granted is intended, and shall be construed, to extend only unto, and to be taken of, such Duties, Customs, and Subsidies, as were granted, and in Being, before the 15th Day of November, 1643, and before the former Tenth Part formerly mentioned was granted." "I James Till, Gentleman, Lieutenant Colonel of Horse, do hereby, in the Name of Sir Thomas Middleton Knight, promise and undertake, That no Violence shall be offered to the Person or Goods of Edward Lord Herbert, or any Person or Persons within his Castle of Mountgom'y; and that they shall have free Liberty to go out of the said Castle, and carry away their Goods and Money, whensoever they will; and that a good Convoy shall be granted, for the safe doing thereof, as far as Coventry; and Recommendations given to the Officers there, for the further conveying of the said Persons and Goods to London, if it be required; and that, in the mean while, a true Inventory shall be taken of all the Household Stuff used in the said Castle; and of all the Books, Trunks, and Writings, in the said Castle; and (fn. 4) of all the Horses and Cattle in and about the said Castle, and all Provisions of Victuals." (fn. 5) "Letters from Sir William Brereton, Sir Thomas Middleton, Sir John Meldrum, of the great Victory (by God's Providence) given them, in raising the Siege from before Mountgomery Castle; and how they routed and totally dispersed His Majesty's Forces, under the Command of the Lord Byron, where they took all their Carriages, Arms, and Ammunition, and made them fly to Shrewsbury and Chester; with a List of the Names of all the Commanders and Officers taken and killed in the said Service. "To the Right Honourable the Lords and others of the Committee of both Kingdoms, sitting at Darby House, in Westminster. "That God who is most glorified by working by the weakest and unworthiest Instruments, hath this Day given a most glorious Victory, and as much ma nifested His Power therein as in any Day I have been engaged since the Beginning of these Wars. "We have relieved Mountgomery Castle, wherein there was closely besieged, and much distressed, the Lord Herbert of Cherbury, Colonel Price, and most of Sir Tho. Middleton's Officers, and near Five Hundred Soldiers. "We were so very hard tasked by the Multitude of our Enemies (who did much exceed us in Number), as that, if the Commanders and Soldiers had not engaged and behaved themselves very gallantly, or if we had wanted any Part of our Forces, it might have hazarded our Army, for it was very dubious and uncertain which Way the Lord would incline the Victory. It came to Push of Pike, wherein they were much too hard for us, having many more Pikes. Our Horse also, at the Beginning of the Battle, were worsted, and retreated; but there was, I do believe, an unanimous Resolution both in Horse and Foot to sight it out to the last Man. Indeed there could be no other Hope or Expectation of Safety or Escape, there remaining no Way of Retreat, all Passages being entirely in the Enemy's Power (if Masters of the Field); and truly, if God had not infatuated, they might easily have interrupted our Passage, and made good divers Passes against us. But our Extremity was God's Opportunity to magnify His Power; for when it was most dubious, the Lord so guided and encouraged our Men, that with One fresh valiant Charge we routed and put to Retreat and Flight their whole Army, pursued them many Miles even in the Mountains, and did perform great Execution upon them; slew (I do believe) Five Hundred, wounded many more, took near Fifteen Hundred Prisoners, and amongst them Colonel Broughton and Colonel Tilsley, who they report to be General Majors. There were also taken Lieutenant Colonels, Majors, and Captains, more than Twenty; and all their Carriages, and near Twenty Barrels of Powder, wherein they were furnished the Night before the Battle. We took also (as was conceived) near Fifteen Hundred or Two Thousand Arms, most for Foot. Most of their Horse escaped towards Shrewsbury and Chester. "The Enemy's Army was reported (and I do believe it) was no less than Four Thousand, the Foot being the old Irish, who came out of Ireland with Col. Broughton, Warren, Tyllier, and some of Colonel Ellis, and some of Colonel Sir Michael Woodhouse's, and Sir Michael Ernly's Regiment, from Shrewsbury, Chester, and Ludlow. Our Army consisted of about Fifteen Hundred Foot and Fifteen Hundred Horse. We lost not Forty Men slain, and I do believe there was not Sixty wounded. Our greatest Loss was of Sir Wil. Fairfax and Major Fitz-Simons, most gallant Men. Sir John Meldrum did with much Judgement order and command these Forces, and therefore deserves a large Share in the Honour of this Day's Success. But indeed the whole Honour and Glory is to be given and ascribed to God, the Giver of Victories, and who is most deservedly stiled The Lord of Hosts. "We know not how to dispose of these common Prisoners, unless it would please you to order some of them that will take the Covenant to be shipped (if God gives us Liverpoole) and transported over into Ireland, to serve you there. "We have left Sir Tho. Middleton in a good Condition in Mountgomery Castle; and the Gentlemen of the Country begin to come in unto him. Sir John Price is already come unto him before I came thence. The Lord Herbert is come away with us towards Oswestry." "For the Right Honourable the Committee for both Kingdoms, at Darby House, in Westminster. Mountgomery Castle, Septemb. 19, 1644. "Since the writing of this Letter, it hath pleased God to take to His Mercy Sir W. Fairfax, who is even now dead." "For the Right Honourable the Lords and others of the Committee of Safety for both Kingdoms. Montgomerie Castle, Septemb. 19, 1644. "A List of the Prisoners taken and slain at the Battle near Mountgomery, upon the Eighteenth of September, 1644. DIE Lunæ, 23 Septemb. 1644. "Ordered, by the Lords in Parliament assembled, That these Letters be forthwith printed and published. 5. These Letters are printed, and bound in with the Original.